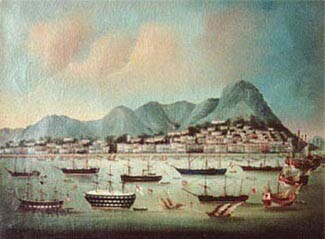 ... 1839, having withdrawn from Canton (today, Guangzhou) amid a struggle with China's Qing authorities regarding its overseas trading posts in China, Britain seized Hong Kong (right) as its base of operations. The move would prove a prelude to the 1st Opium War. At the time "a minor outpost," the harbor region and island of Hong Kong, both on the southern coast, would become a major anchor, in political and economic terms, of British imperial power. (image credit) As posted, China would regain Hong Kong in 1997.